Captain Mike and his 1st mate saying bye after we returned. 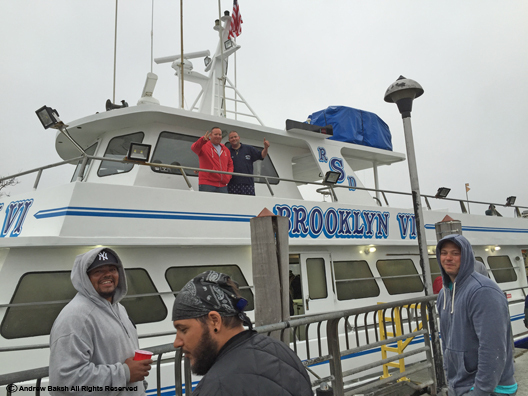 When the Brooklyn VI pulled out of Sheepheads Bay in Brooklyn NY on June 1st for the See Life Paulagics, overnight pelagic, almost everyone save for those crazy optimistic types were probably thinking about the weather. It was almost 6:00 p.m. when I parked and headed towards the boat and the clouds were gathering. 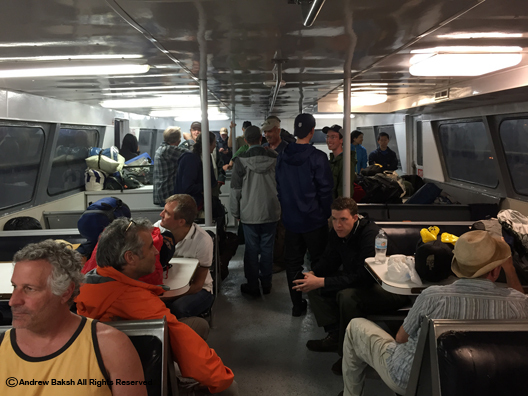 Rain was on its way and it was going to be a rough ride heading out to sea, especially for those who might be assigned to sleep on the top deck. One leader who was assigned the top deck "presumably" took one look and bailed out attributing his departure to not feeling well. I don't blame him, I might have felt sick too had I ended up on the top deck. 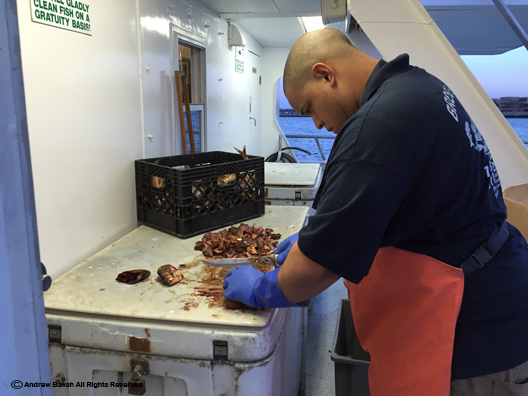 Jesus who worked hard all through the trip providing a steady supply of chum. Luckily, signing up early paid off, I was first to be called and I grabbed a bench in the lower deck cabin. This, by the way is the process of assigning benches--it goes by who signed up first, which I think is pretty fair. A few, rather I should say all of our leaders as far as I know, opted to stay top deck thereby leaving room for more folks in the cabin. And that night, you wanted a cabin slot because it was raining, meaning a wet, cold and likely a miserable ride out for anyone on the top deck which had no cover. I decided to try and get some shut eye and so after most people had their fill of chatting and getting their sleeping area sorted out the cabin gradually got quiet. Participants await their bench assignments in the lower cabin. I was in and out of sleep for most of the night and was up and ready for birds at around 3:45 a.m. By 4:00 a.m. I was geared up and heading outside to the stern of the boat. I checked in with the crew and found out that we were some 120 miles offshore, the seas were calm and you would not know we rode rough seas the night before. Some people were already up and our chum monkey (pelagic term), Jesus was already getting the good stuff together. Paul Guris the owner of Sea Life Paulagics had explained the strategy for the day the night before. 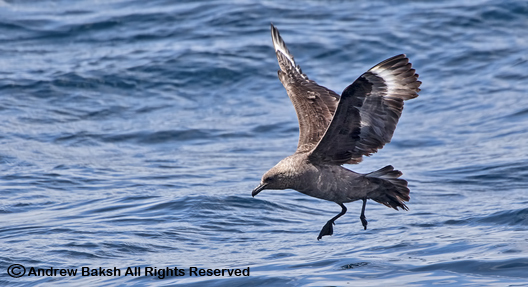 We were going to set out a chum slick (consisting of fish oil, beef fat and other nasty stuff--good for the birds but not something we want to chow on) which we hoped would first bring in the Petrels including Leach's as well as the expected Wilson's. It did not take long before we began to get flashes of Petrels; some, we could identify with the help of the boat lights while others were just flashes. Soon we had ample light and all hands were on deck as calls for Leach's among the many Wilson's Storm Petrels began to fill the air. 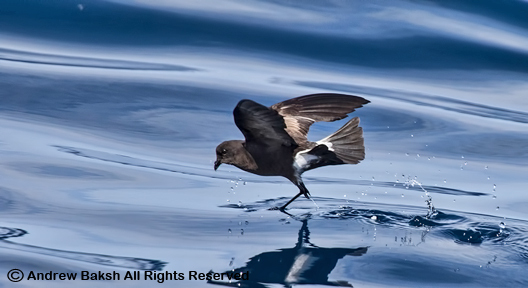 Wilson's Storm Petrel dancing on water. Not long after the 1st South Polar Skua made its appearance. I had a hand in seeing it first but could not get a solid ID and mumbled large bird/shearwater type way out near the horizon. It was way out and one of our leaders on top got on it as it broke the horizon giving a better view and called it out. South Polar Skua, was a target bird and for many it was a life bird, for others like myself it was a state bird. I was quite happy but hoped for better views. 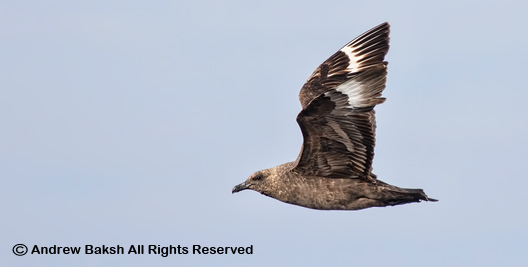 Little did I know that I would see 5 more South Polar Skuas before the trip was over--most with killer views and I fulfilled a wish of mine as I got to shout, "SKUA" on a New York Pelagic. 1 of several South Polar Skuas seen throughout the trip. 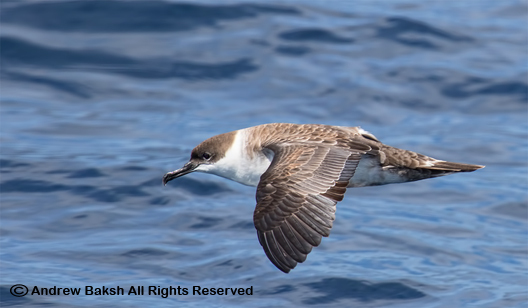 In fact, by the time the trip was winding down, shouts of SKUA hardly evoked any responses, imagine that on a New York Pelagic. Other great birds we got included Audubon's, Manx, Cory's Sooty and Great Shearwater, a sweep for the expected Shearwater species, Long-tailed and Pomarine Jaeger along with Arctic Tern rounded out the birding highlights. The non birding highlights included Blue Shark, Risso's Dolphin, Common Dolphin, Offshore Bottlenose Dolphin, Portuguese Man O' War, Mola Mola (Ocean Sunfish), Pelagic Barnacles likely the genus lepas , and one of the best moments of the trip a Basking Shark, which breached twice. Overall, it was a fantastic trip but not without some issues for some as a few people got very sick. I myself felt queasy twice but managed to held it together. If you are interested in See Life Paulagics, check out their website. Paul and Anita Juris are two of the nicest people trip/organizers you could meet. The leaders can fluctuate but for the most part, the consistent lineup include Sean Sime, Doug Gochfeld, Shane Blodgett, Angus Wilson, Andy Guthrie, Joe DiCostanza, Shai Mitra and others (sorry forgot all the names) along with Paul and his gregarious personality all work hard to get people on birds. In addition, there are several people on board who equally lend their skills to spotting and getting people on birds. 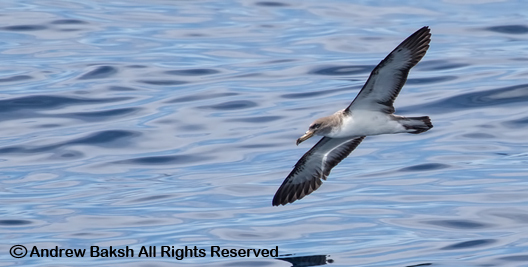 The New York Pelagic Birding with See Life takes on a family affair atmosphere. Our next trip is in August and maybe I'll see you on-board on out next outing. 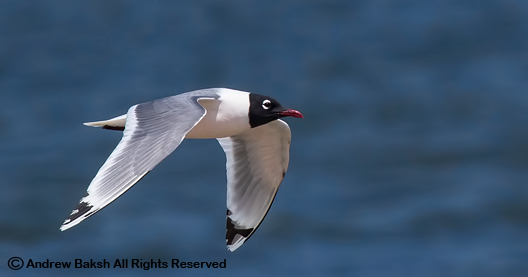 In what appears to be a first documented record for Brooklyn, a Franklin's Gull (Leucophaeus pipixcan) was discovered by photographer Deborah Allen. It was a chance find, as Deborah who was photographing Laughing Gulls at Plum Beach discovered the adult Franklin's as she was cycling through her photos. Realizing the rarity of such a bird, she immediately got the word out and Brooklyn birders were out the next day looking for the bird. Fortunately, the bird stuck around and has been putting in sporadic appearances along the beach. 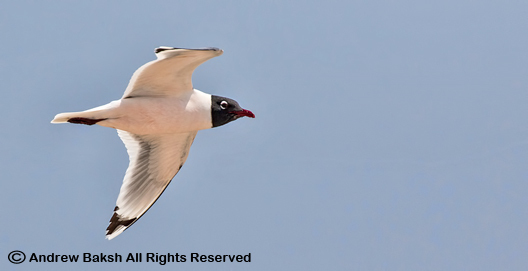 Franklin's Gull is rare for downstate New York; it is more uncommon in upstate NY with more sightings reported in those areas. The New York State Avian Records Committee (NYSARC) records show birds documented in Suffolk County LI and upstate NY. This is a bird that breeds in the northern plains and most of them tend to spend the winter south of the Equator along the west coast of South America. Its diet includes, insects, worms, fish, mice, garbage and seeds. 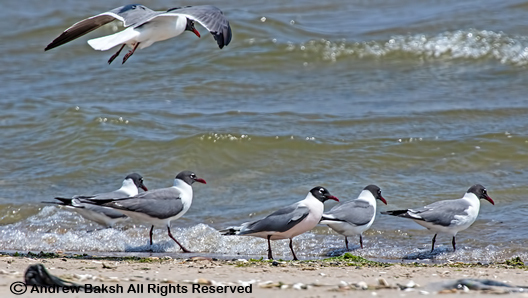 Interestingly, the Brooklyn FRGU appeared to be foraging with the Laughing Gulls on Horseshoe Crab eggs on the beach. I saw this bird with friends Tom Burke and Gail Benson along with several other birders on Monday May 25th. It was re-found first by Shane Blodgett and then refound again by Sean Sime who was with Rob Jett. It was Sean's phone call that enabled many of us who were on the eastern end of the beach to see this bird. The views were distant and not for long so I returned on May 27th where I enjoyed extended views of the bird. During this visit, I documented the bird capturing both video and photos. Here is a shot showing the Franklin's and Laughing Gull in flight. Note the difference in the wingtips. The Franklin's has less black in the primaries and show an extensive mirror on P10. Even in this distant photo the thicker eye arcs of the Franklin's can be seen. Here is a flight shot of the Franklin's showing the top side; it also provides a closer look at the wingtips. What a handsome looking Gull. Here is a side by side comparison of the Franklin's with a Laughing Gull. Here you get a look at the smaller bill. Note the nape of the Franklin's as the white goes further into the hood than on a Laughing Gull. This was a feature that enabled a few of us to pick out this bird from a distance when we observed it on May 25th. 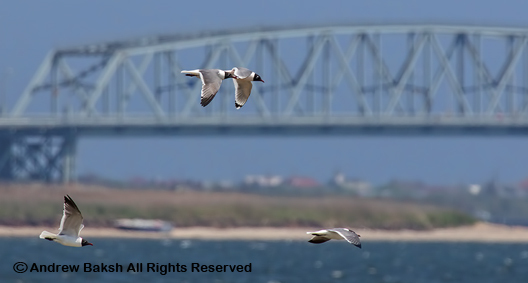 Another flight shot of the Frankin's Gull (Leucophaeus pipixcan). Here you get another look at the bill size, the thicker eye arcs and white in the wingtips. Finally, this shot shows the underside nicely. Here you could see the pinkish tone that is on the chest and belly of the Franklin's Gull plus another view of the underside of the wing showing the primaries. 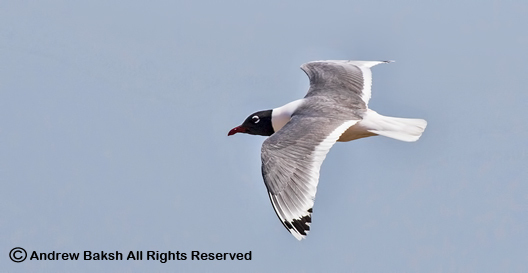 Here is a cool tidbit - Do you know that Franklin's Gull is unique in that it is the only Gull to have two complete molts in a year rather than one.